Western Media In China: Adjusting To The 'Anaconda' : Parallels Staffers at Bloomberg News accused editors of spiking an investigative story to avoid the wrath of the Communist Party. But analysts say accusations of self-censorship go far beyond this one case. One American academic compares China's censorial authority to a "giant anaconda" — its mere presence enough to make people limit their behavior. An exterior view of the Bloomberg building in New York. Bloomberg staffers say editors spiked a story that exposed financial ties between a tycoon and family members of top Chinese officials. Last weekend was a bad one for foreign reporting in China. 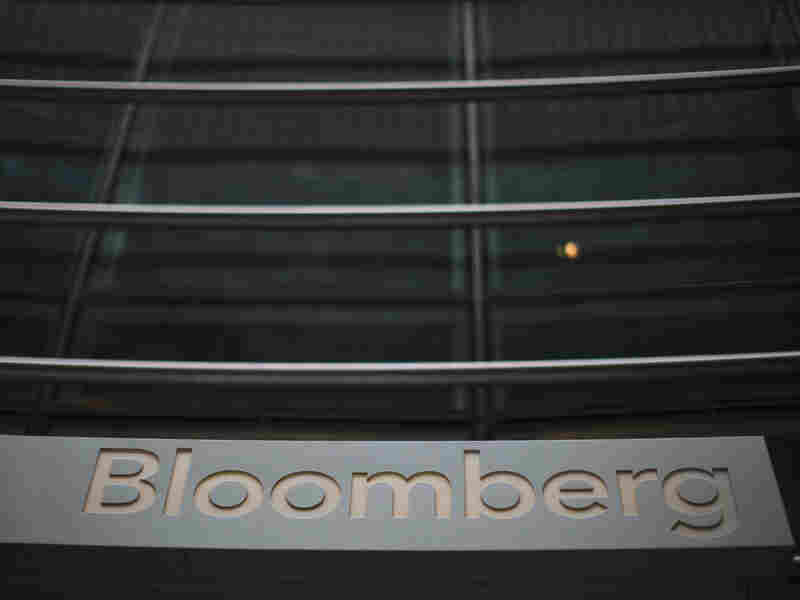 Staffers at Bloomberg News accused their own editors of spiking an investigative story to avoid the wrath of the Communist Party, and the wire service Reuters confirmed Chinese officials had denied a visa application for a hard-hitting reporter after an eight-month wait. Bloomberg staffers told The New York Times that editors had spiked a story that exposed financial ties between a tycoon and family members of top Chinese officials. Sources said Bloomberg Editor-in-Chief Matthew Winkler defended the decision, comparing it to foreign correspondents who self-censored to avoid getting kicked out of Nazi-era Germany. Winkler denied the accusations, saying the story — and another about the children of senior Chinese officials employed by foreign banks — are still active. "What you have is untrue," he said in an email to The Times. Contacted by NPR, a Bloomberg spokesman would only say: "We have high editorial standards and these stories were not ready for publication. Any suggestion they didn't run for any other reason is absurd." The Financial Times, however, published contents of an email it obtained suggesting Bloomberg editors were keen on the investigation as of late September. "The story is terrific," wrote Bloomberg Managing Editor Jonathan Kaufman, according to the FT. "I am in awe of the way you tracked down and deciphered the financial holdings and the players. It's a real revelation. Looking forward to pushing it up the line." Allegations that Bloomberg was spiking an expose appear to have first surfaced publicly in an unlikely place, a satiric, online Chinese-language video. Next Media Animation, a Taiwanese company known for videos that mock the Communist Party, put out a scathing one on this episode. But Emily Parker, a senior fellow at the New America Foundation, a Washington, D.C., think tank, says accusations of self-censorship go far beyond this one case. "I think there is going to a tendency to really pounce on Bloomberg and to say: 'Shame on them and how could they do this?' " says Parker, who has written about self-censorship in China and has just finished writing a book on the Internet and social media in China, Russia and Cuba. "I don't really think that's the most positive way to discuss this story, because I think what's clear is that this is a much larger phenomenon." Parker says all kinds of organizations — including universities, publishers and Hollywood movie studios — are under pressure not to offend the Communist Party and will curtail their behavior to avoid conflict. Parker says Perry Link, a well-regarded China scholar at the University of California, Riverside, described it best in a 2002 essay for the New York Review of Books. "The Chinese government's censorial authority in recent times has resembled not so much a man-eating tiger or fire-snorting dragon as a giant anaconda coiled in an overhead chandelier," Link wrote. Link said the anaconda didn't have to set limits, or even move — its mere presence was enough to make people limit their own behavior. "Everyone in its shadow makes his or her large and small adjustments — all quite 'naturally,' " Link wrote. Both Bloomberg and The Times did prize-winning investigations last year documenting more than $3 billion worth of hidden wealth controlled by the family members of top officials. China's government was furious. It responded by blocking the companies' websites — costing The Times millions of dollars in advertising revenue on a new Chinese-language platform — and denying some visas. Bloomberg also lost money on its core business, selling financial information through the firm's computer terminals. "I think as China gets more powerful and as more and more people have vested interests there, it's going to be harder and harder to kind of speak out independently," says Orville Schell, a journalist and author who runs the Center on U.S.-China Relations at the Asia Society in New York. Schell says China has growing leverage over those who rely on the country for revenue or their livelihoods. "Every media outlet must cover China to be in the big top," Schell says. "If they get precluded, and this is true of individual journalists as well, whole careers can be completely destroyed if you can't get access." The most recent correspondent to be precluded is Paul Mooney, who had worked in Beijing for 18 years, reporting on staff for various publications, including Newsweek and Hong Kong's South China Morning Post. Earlier this year, Reuters hired Mooney, who's written extensively on sensitive issues, such as human rights, child labor and conditions in Tibet. Mooney says Chinese officials spent an hour and a half interviewing him as part of his visa application at the consulate in San Francisco. They asked about his views on Tibet. They even quoted from interviews he'd given. At the end, Mooney recalls, they said, "'We hope that — if we give you the visa — that you'll report more objectively in the future.' And to me, this is outrageous that a government would suggest something like this to a foreign reporter, that we have to report the way they want us to report. Otherwise, we won't be welcome." Chinese officials told Reuters last Friday — which happened to be National Journalists Day in China — that Mooney would not get a visa. They gave no reason. Mooney has company. Last year, China expelled Melissa Chan, a reporter for Al-Jazeera English, who had embarrassed the government with reports about secret detention centers, known as black jails, and forced abortions. Mooney thinks his visa rejection will affect other reporters. "They are all going to be thinking about this when they go out and do their next stories that if I write about sensitive political issues, am I going to get my visa renewed?" Mooney says. "I think it's going to send a chill down some people's backs." Mooney says one solution to the pressure foreigner reporters face in China lies with foreign governments. In 2011, more than 800 Chinese nationals came to the United States on international journalist visas, known as I visas, according to U.S. Customs and Border Protection. "If the U.S. government reciprocated by sitting on a handful of visas for Xinhua News Agency, or CCTV or the People's Daily," says Mooney, "I'm sure that within a week all the problems we're having with visas would be solved." In 2011, California Republican Dana Rohrabacher introduced a bill to that effect, but it hasn't gone anywhere on Capitol Hill. Mooney says when he raises the idea of visa reciprocity, U.S. diplomats are reluctant to retaliate against Chinese reporters. After all, it runs counter to the First Amendment of the U.S. Constitution, which guarantees freedom of the press.